It was two years ago this July that I took the biggest trip of my life thus far! The journey covered 6 countries in 2 and a half weeks. A lot a miles were covered but the greater journey was the one that my mind’s eye experienced. I saw, tasted heard and smelled things so foreign to my senses that even two years later I am still unraveling the affair! I can’t explain it but when I came back from our trip I didn’t want to share it with anyone! I wanted to keep it locked up and safely close to my heart. The memories are like a rare and delicate lace that I pull out on special occasions to peer at life through. They decelerate my fast paced life for a brief unhurried moment. I treasure my memories like a fine old wine! However, I decided to start working on piecing my memories together and giving them to you too. I started thinking about it and, well, wine is always better when it’s shared amongst friends! So I hope you enjoy my unravelings! Of course we did! Ok I made them. They hated me for it but we had to! The side walk and walls on AR are covered with thoughts and messages from fans. 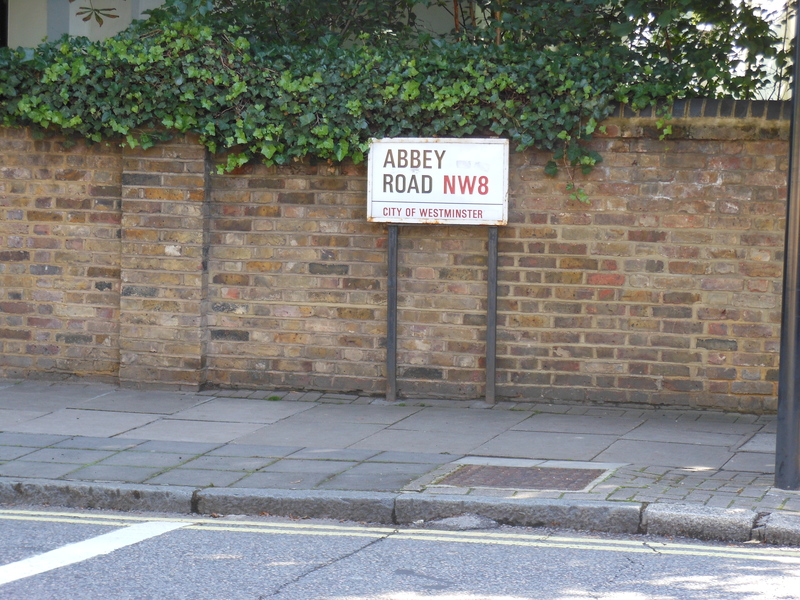 Abby Road is just a road in a somewhat wealthy middle class neighborhood but the notes make it so much more than just a road. I guess that’s much the same with the Beatles and their music. Without their fans they would have just been another talented band that tried to make it. 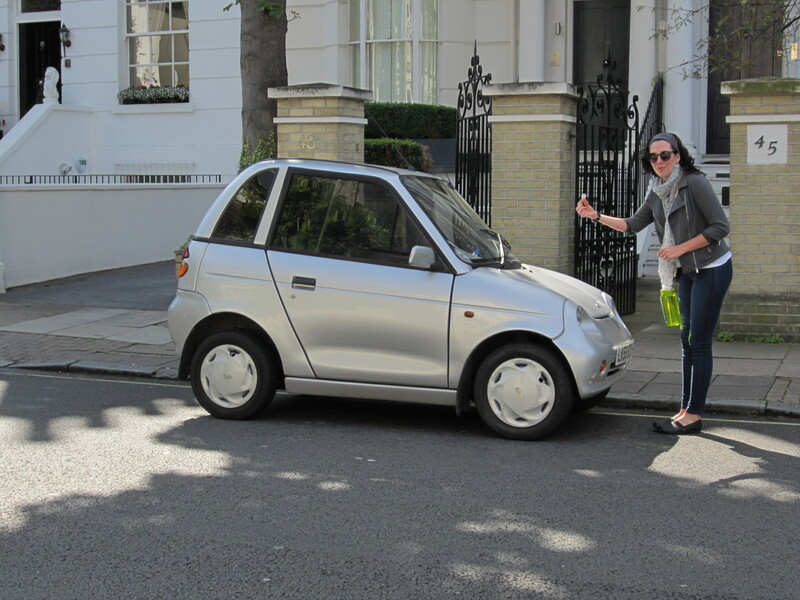 Can you believe these tiny cars! This is for my sister Sarah and her girls! I took it solely for them! 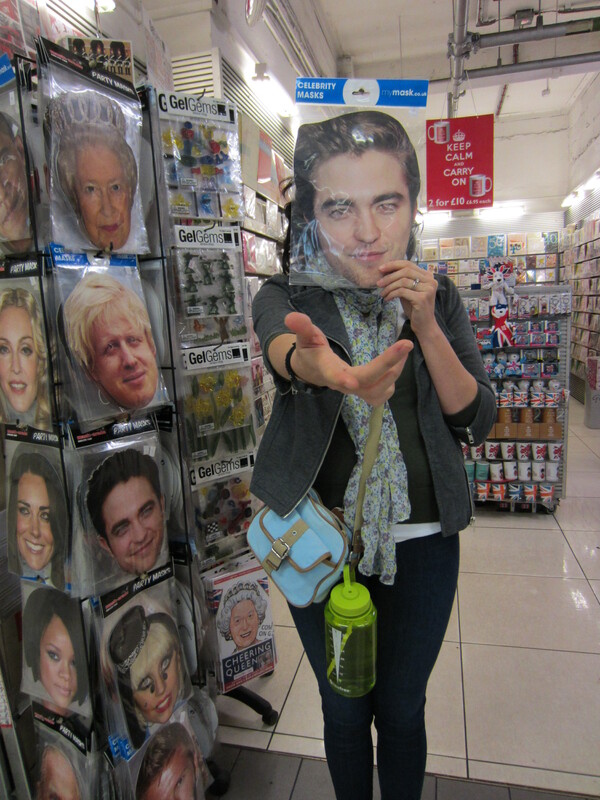 There were gift shops like there all over the place but this one had awesome celebrity masks! After Abbey Road we took the train to Baker’s street!!!!! I completely nerded out on this one!! After breakfast of yogurt with granola (homemade!) we headed to the Sherlock Holmes museum! Off to 221 Baker Street!!! It was so much fun to feel close to one of my favorite fictional heroes! My favorite thing was the violin in his study! I could almost see him playing and hear the screech as Holmes drags his bow across the string to match the rhythm of his deep thoughts. Oh I was a kid again and I was an adult in love with the mystery and intrigue! Aaaaaah! I am 12 and I am at 221 Baker St. Heading up Mrs Hudson’s stairs! In the train station at Baker St.
We saw the London Bridge which looks like a story book bridge with its blue stumpy legs. It has personality. Me and Dave went to the Globe theater and saw Henry III. It was surreal. The plain planked wooden stage with player dancing in and out of Shakespeare’s rhyme and humor reminding me of a waltz performed deftly by the lighthearted feet of nobleman. They played his words like a great symphony. I love Shakespeare. Love reading his work but never has it come alive for me like it did today! The two children in the play caught my attention. How wise and passionate beyond their years they must be perform and nail their lines. To feel the level of emotion required to do justice to such worshipped literature leaves me breathless with excitement! I was so happy to share this with Dave. After the play at the Globe we grabbed coffee and trekked our way back to the London Eye. It wasn’t that far away and it was nice to have a little time to quietly take in the city skyline. The streets of London are romantic to me. They represent and resemble a newer version of the muddy pot hole filled streets described in so many stories from my childhood like Oliver Twist and the Tale of Two Cities and Sherlock Homes!! London is like a wise old man compared to baby America! The London Eye is like a Farris Wheel on steroids and like the giant that it is, it moves its outstretched capsules around in slow rotation that is almost undetectable to the average onlooker walking by. I had to stop in order to see movement! There is so much more I could tell you but it would take so much more space and you might stop reading in the middle. I treasure my memories like a fine old wine! However, I decided to start working on piecing my memories together and giving them to you too. I started thinking about it and, well, wine is always better when it’s shared amongst friends! So I hope you enjoy my unravellings! This was a long day for everyone! 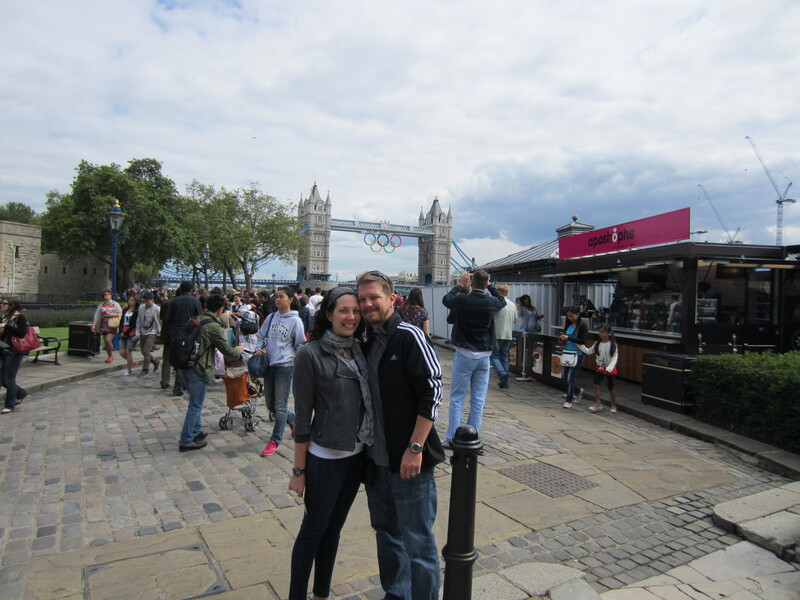 We got to London and went straight to the city without dropping off our bags. It was such an awesome day though! We started with coffee at Pret. I had a flat white which is steamed milk over a double shot of espresso. So good and my eyes wouldn’t shut even if I wanted them to! I think it originated in Australia though so not very British! We walked all over the city but before all of that we went to Buckingham Palace to see the changing of the guards. BP was really breathtaking but very opulent and very gold. I never realized that gold looks so alive and kind of on fire or like it is still molten but this does!! I loved the Victoria Memorial! It was so opulent and stark against the grey sky. After that we hiked to Westminster Abby, Big Ben and caught a glimpse of the London Eye which I can’t wait to see up close! Yes! I wish we could have done this tour! It was rainy all day and a bit cold but I didn’t mind. I had energy all day though not sure where it came from (probably the flat white). Today the one thing that really was most unique was hearing accents but not just from famous British people like I have only ever heard! Children spoke with a heavy British accent. It just seemed odd and cute when I would hear them talk! There is so much to see in London!! 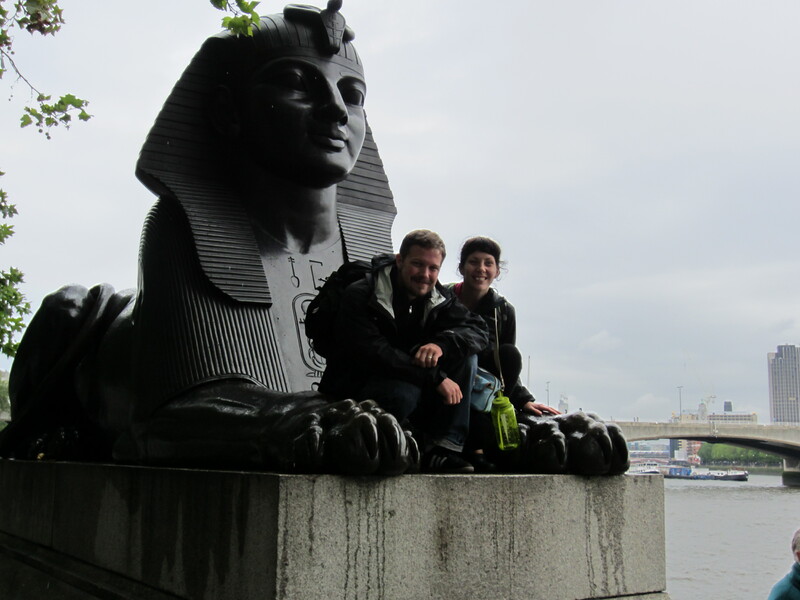 This is the Sphinx at Cleopatra’s Needle, Victoria Embankment (Thames), London. Cleopatra’s Needle is the name given to an Ancient Egyptian obelisk that was brought to Britian and erected on the Embankment in 1878. It is flanked by two sphinxes cast in bronze. 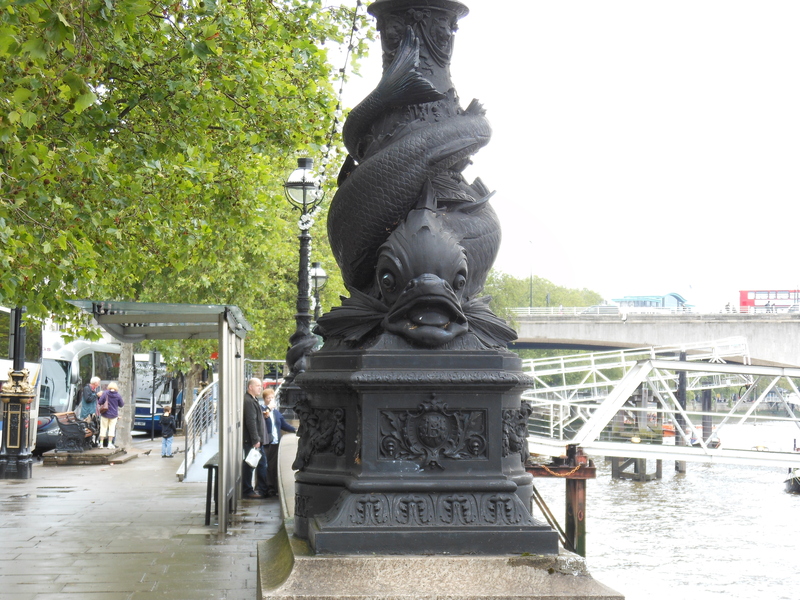 sturgeons – George John Vulliamy, the Superintending Architect of the Metropolitan Board of Works created several of these lamps built into the retaining river wall of the Victoria Embankment in 1870. Of course we had to stop for real fish and chips at this little place! We were soaked and it felt good to sit. I remember we sat outside because the sun came out. The birds came out too! They scurried around under our table hoping to get a crumb! We stopped at Starbucks towards the end of this day and while we were sitting spotted a wedding across the street. I enjoyed the scene as the bride and guests spilled out of the church. I couldn’t help but think how extraordinary such a normal scene seemed to me as an outsider. We went back to the hotel and while the boys took a nap I took a shower and went for a walk with Amy (technically we got lost trying to get to a shop Amy wanted to purchase some things she had seen online!) which turned out to be really interesting. London is full of all kinds of nationalities and cultures that seem to be kind of segmented off from one another. On one street you will see Spanish people playing salsa on the radio. On the next street there are old Italian women hanging clothing on a line. Neither of which seem to know about the other’s existance. When we got back to the hotel around 7:30pm all of us got ready and went to Piccadilly square. This was what I saw: Lights! Huge TV screens like you would see in Time Square, stylish young women in chic ankle boots and miniskirts, Korean people with scarfs and ballet slippers, girls busy shopping while sporting neon leggings, old and tall white castle-like buildings, speeding taxis that look like old Mercuries! Piccadilly was so full of energy that it was contagious! I want to go dancing or walk faster or RUN through the street because I can’t take it all in fast enough!!! I wonder if I could pull this off! Then… we turned down a street and stumbled upon China Town. Quieter with a red hazy glow over the damp street. Paper lanterns hang from the sky ahead like little suns lighting an exotic path through the streets of London China Town. Eateries line the street and outside Chinamen beckon you to try their cuisine. One window I peeped into held a waiter. He was an old Chinese man who, having caught my eye, swept his hand wide in a welcoming gesture above the empty table he had prepared. I smiled though not ready to commit to his table and pressed on down the street until finally deciding on the London-China House. Truly for no reason, we ate there. I think something told me to keep the old Chinese waiter in my pocket as a memory just the way I saw him. The place that picked us! Dinner was delicious or maybe excitement really does makes everything taste better. I had curry vegetable and mushroom. After dinner we hopped the train back to our hotel, bought a night cap drink of Jack n Ginger and passed out exhausted before I got half way through my drink (we had our drinks in the hotel room). It was an early night as everyone was on the verge of passing out. I say it was early but it was close to 3am when we went to bed. My internal clock is so far off today! Either way we are so dead tired! 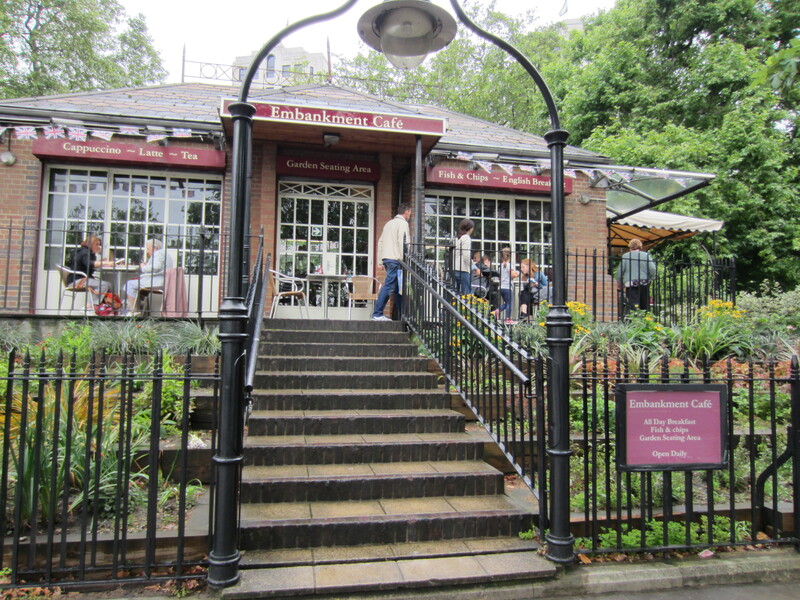 July 14th, London – Oh Victoria! I treasure my memories like a fine old wine! However, I decided to start working on piecing my memories together and giving them to you too. I started thinking about it and, well, wine is always better when it’s shared amongst friends! So I hope you enjoy my unravelling! We got on the train to Victoria . It’s weird but looking out the window the city looks like any other in the U.S. However what looks really different are the houses! They are so old and pretty! It looks like they have terracotta roofs and Windsor style windows. I can picture a little old lady having tea with a terrier passed out in her kitchen. 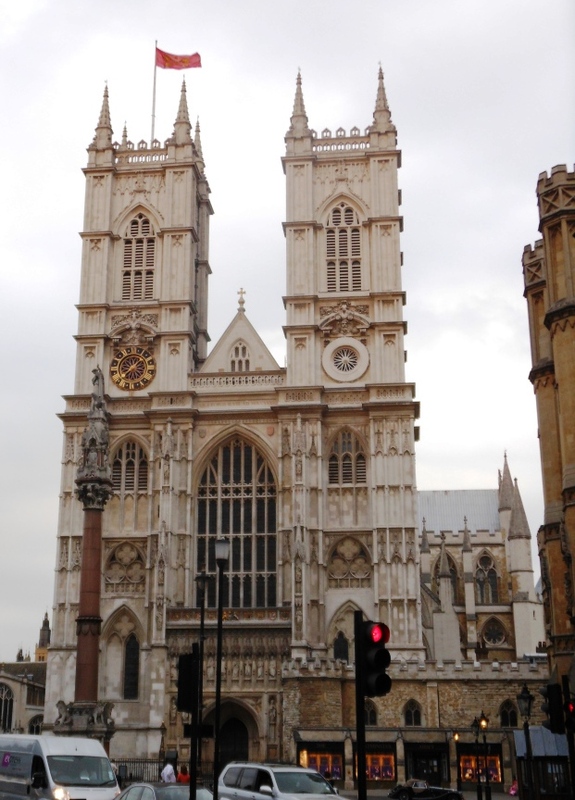 Here are a few pictures I took when we arrived in London! Next stop Buckingham Palace! London you look like America? Ames loving on her bag. Josh only inches from disaster. Look out when boarding the train! July 13th, Europe Here We Come!! It was two years ago this month that I took the biggest trip of my life thus far! The journey covered 6 countries in 2 and a half weeks. A lot a miles were covered but the greater journey was the one that my mind’s eye experienced. I saw, tasted heard and smelled things so foreign to my senses that even two years later I am still unraveling the affair! I can’t explain it but when I came back from our trip I didn’t want to share it with anyone! I wanted to keep it locked up and safely close to my heart. The memories are like a rare and delicate lace that I pull out on special occasions to peer at life through. They decelerate my fast paced life for a brief unhurried moment. So we went to Europe 2 years ago. I started sharing this experience a year ago but life got crazy and I had to postpone it for a while! It was one of the most amazing trips I have ever taken! We traveled with another couple which made it fun, interesting and more economical. 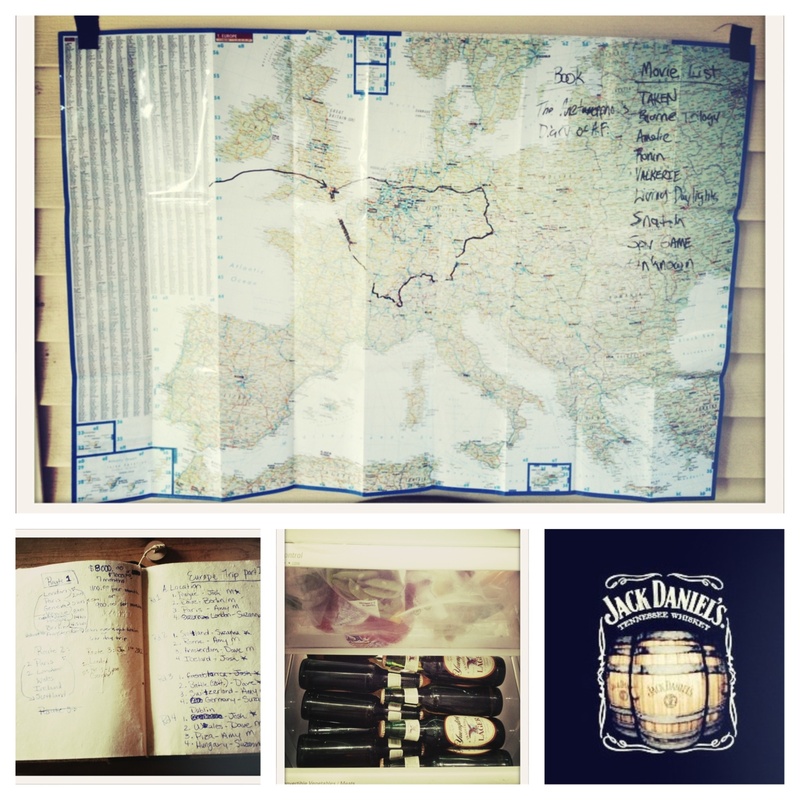 We tried to journal everything as we went along. When we returned home I was speechless! Something so big is so hard to share with other people because it’s difficult figuring out where to begin. I thought of a lot of different ways to share my memories. In the end I decided to jump in by starting right at the beginning. Long before we stepped foot on an airplane I had a plan. We had a recipe which consisted of purchasing, (tickets, flights, hotels etc) packing, scheduling and knowing when to stop and take it all in. When I started thinking about how to pack for Europe I immediately had a moment of panic. It’s hard enough to pack for a trip to another country but we were visiting 6 different countries in 16 days!!! My goal was to prepare for hot, cold, rainy weather, and maybe a few nice dinners out. On top of packing for all occasions I needed to pack light because we would be on the move a lot. I needed my bag to be light so it passed the weight/size limitation for carry on luggage but I also wanted to be able to carry whatever I had for long periods of time if I had to. My goal with packing was to layer so I could get as many outfits out of as few garments as possible. Here is what I ended up with. After looking for a really long time I found The North Face Flyaway Rucksack that weighs virtually nothing and a small cross body purse! Brown sandals (use as shower shoes as well) and Black Anu Walking shoes (so comfortable!) and a 1 piece swimsuit that I wore as a shirt under sweaters too. 1.Head band. My bangs drove me nuts after day one of rainy London! 5. Dr. Pepper lip gloss and blush. I’m pleased to say the only thing I never used was the watch with an alarm clock! Our phones and ipads had built in alarms! Yesterday marks one year since our tour of Europe. A year ago I wanted to keep everything close upon returning from our trip because I wasn’t ready for other people’s input or remarks. I just wanted to mentally unpack everything and think about the different people, sights, smells and sounds. It was such a big experience in my little world. For years I thought about how cool it would be to see London. How different was it from the descriptions you read in old books?! How different was the world from the way I pictured it in my mind? A year ago today we set out on a train hopping trip through the UK, France, Austria, Germany, the Czech Republic and Holland. It all started on New Year’s Eve 2011 sitting around with our good friends who just happened to be married to each other. We started talking about where everyone had traveled and in my case where I had not been but always wanted to go. For some reason I have managed to never travel anywhere outside of the U.S. It’s odd because everyone in my family has traveled to or lived in at least one other country! Dave took me to Costa Rica for our honeymoon a couple of months prior to our talk on New Year’s Eve and it was amazing!! So I’m going to claim least experienced in the group. I had never left the country prior to that. Eventually after several drinks it turned into a discussion of where we would go and when! Hmmm maybe we should plan a trip to Europe. And so we did! Josh was really great at picking out possible routes to travel and Amy was so great at planning the details! Dave was always the best person to scope out both pros and cons when it came to picking a route. In short it didn’t matter where we went because it all looked awesome! June finally rolled around and there were less than 30 days left to pack and prepare. The excitement was almost unbearable! I could hardly focus on work and day-to-day life because my mind was cloudy with the possibilities and unknowns. What would Europe be like? What did people really eat and wear and talk like? How would I feel when I stood where Jim Morrison was buried? What experiences would I carry home with me? …are French macarons better in France and can I find and stalk Johnny Depp in London? I’m sort of joking about Johnny Depp… haha hmmm! I still can’t name the most epic thing that came from this trip and I couldn’t a year ago. I can’t tell you that I liked one place more than another. It would be like going sky diving, bungee jumping and rappelling in the same day and then having to come up with the most exhilarating moment. It just isn’t that easy to pin point the “best” thing when every moment is just as exciting as the last and everything is new to you! It’s like being 18 again. You don’t want to blink for one second because you might miss something amazing! So I pulled out the box of memories today. Yeah that’s right you guessed it. It’s time for a Europe montage.